It is amazing how warm weather and the opening of outdoor pools ushers summer in regardless of the calendar. Instinctively I have adapted to my “summer routine”. Tuesdays are my run days – either speed work or tempo in the morning. My afternoons are weight lifting. Same as last week, what is different is I am able to sit by the outdoor pool after lifting and read. What is new – I am now blogging by the pool as well. 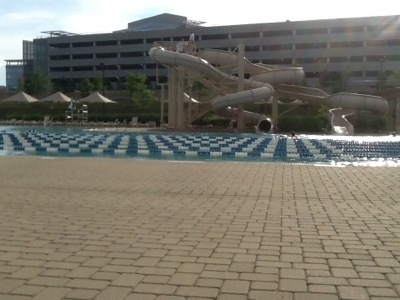 So as I write I am listening to the splash of swimmers’ strokes and the water flowing down the slides. Summer sounds. So while the calendar still says May, the sounds, temperatures, and activities say summer to me. Somedays, like today, can bring stresses and challenges outside of my training. But a good workout, time with my dear friend and training partner and a few moments in the sun “listening” to summer bring so much brightness. More than just the warmth of the sun. I haven’t been down them yet. For some reason the children dominate the slides and during break the water is shut down. I guess adults are not allowed….